Four MLS matches are on tap through the weekend, and this week's most expensive MLS match comes courtesy of the Seattle Sounders. They'll welcome Club Necaxa of Liga MX to CenturyLink Field on Saturday. Columbus Crew SC, Revolution and Red Bulls also host matches on Saturday. On Saturday, the Sounders will take on Club Necaxa, a football club making the trip from Mexico. Seattle is coming off its first victory of the season, and it was on the same day that the club unveiled its 2016 championship banner. Sounders tickets on TicketIQ currently start from $20 each and average $55, as Seattle looks to continue its momentum against a Club Necaxa team that has not won since February. The Timbers are dominating the Western Conference with a league-best nine points and a conference-leading goal differential of positive seven. Meanwhile, Columbus is coming off its first victory of the season, a 2-0 win at D.C. United. Crew tickets at Mapfre Stadium currently average $38 and the get-in price is $19, as Portland and Columbus battle for the only time this regular season. The Minnesota United FC expansion franchise is still in search of its first win, as it travels to Gillette Stadium. The Revolution is not playing anything like the Super Bowl champion Patriots, who also play in Foxborough, Massachusetts. New England is the only MLS team without a point in 2017 season. Revolution tickets on TicketIQ currently average $36 and the get-in price is $15, as the two squads attempt to get out of the basement of their respective conferences. Real Salt Lake fired head coach Jeff Cassar on Monday after the team started with an 0-2-1 record in 2017. Meanwhile, the Red Bulls are looking to bounce back from a 3-1 loss at the hands of the defending champions. 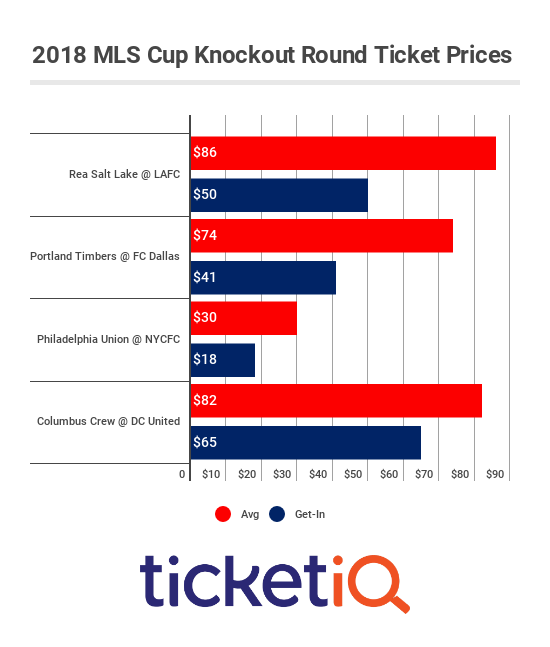 Red Bulls tickets on TicketIQ currently average $35, and the cheapest available tickets start from $13 each, as New York looks to break a tie for first place in the Eastern Conference.